MEDIUM: Hand dye painted on 100% cotton fabric. Can hang without frame. Quokkas are described as the “happiest animals in the world.” Around the size of a cat with a long rat’s tail, the nocturnal marsupials live on Rottnest Island, off the coast of Western Australia. Quokkas are native to Rottnest Island where they live a sheltered live, free from predators and traffic – no cars are allowed on the island. This fabric art painting is based on a photograph I took while cycling around Rottnest Island. The two quokkas were busy rummaging for food in the bushes when I took this picture. I thought they would run away as I got closer and closer; however, one walked over to me and put his paws on my knees and ‘smiled.’ Turns out Quokkas are very human-friendly and love to pose for selfies. 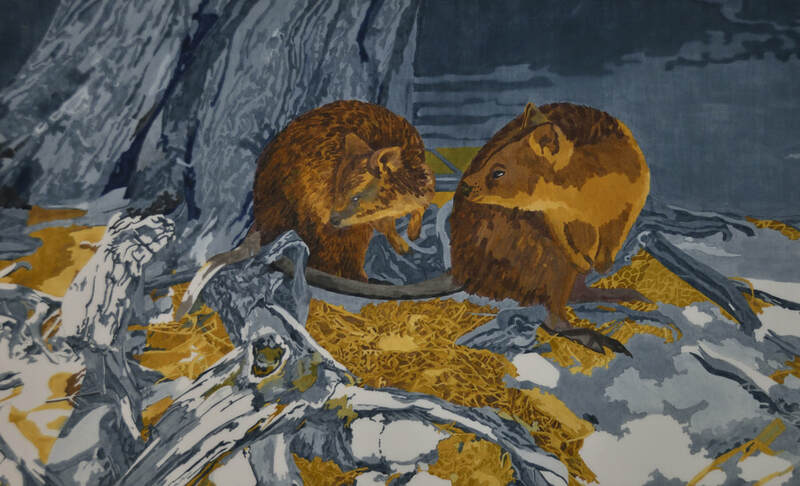 Thank you for your interest in buying the fabric art painting "Quokkas." As soon as I receive this request, I will contact you to confirm order details and total amount of purchase.